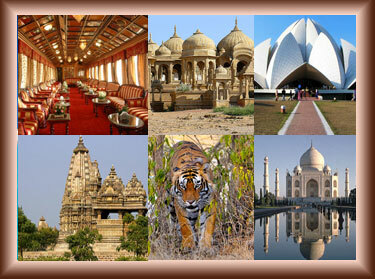 Golden Triangle Tour,Golden Triangle Tours Package, Golden Triangle Travel India,Golden Triangle Tour Itinerary India,Golden Triangle Trip,Delhi Agra Jaipur Tour. Morning tour of Delhi visiting Raj Ghat and Shanti Vana - the cremation sites of Mahatma Gandhi and Jawaharlal Nehru, Jama Masjid and drive past Red Fort and Chandni Chowk. Afternoon visit Qutub Minar built by Qutub-ud-Din Aibek in 1199, Humayun's Tomb, India Gate (War Memorial Arch ), Lakshminarayan Temple - a modern Hindu Temple. Also drive past President's House, Parliament House, Government Secretariat Buildings and Connaught Place shopping centre. Overnight stay in Delhi hotel. Morning drive to Jaipur. On arrial check in at hotel. Afternoon tour of Jaipur. Jaipur - the capital of Rajasthan was given a colour coat of pink a century ago in honour of a visiting Prince and ever since, it has retained this colour. 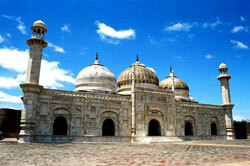 Built by Maharaja Jai Singh, the n otable astronomer, this city is 260 years old. Visit Maharaja's City Palace, the Observatory & Ram Niwas Gardens. Drive past Hawa Mahal & through the pink rose residential & business areas. Overnight Jaipur. Morning visit Amber Fort with an Elephant ride till the main entrance of the fort. 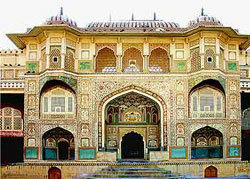 Amber Fort was the ancient capital of the State. 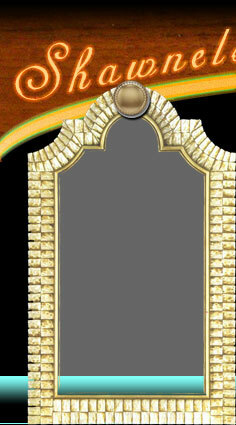 Visit the Sheesh Mahal or the Hall of Victory glittering with mirrors. Rest of the day is free and optional visit to Chokhi Dhani resort - built in ethnical rajsthani style and specially in the evening they organise lot of activities like, camel ride, Puppet show, Snake charmer and handloom cloths etc. alongwith specialised Rajasthani/continental Dinner as well. Return to hotel for the overnight stay.